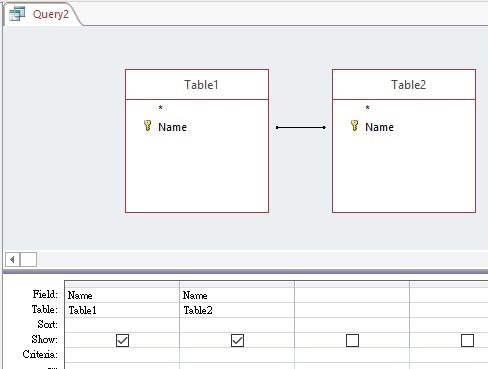 This Access tutorial explains how to perform case sensitive join table, such as case sensitive inner join and case sensitive left join. In Microsoft Access, comparison of text is not case sensitive. For example, Access considers “AAA” and “aaa” are the same. To compare String in Expression, please refer to my previous post about how to use StrComp Function. The most annoying part of case insensitivity is that when we join two tables, “AAA” and “aaa” can join successfully. In this post I will explain how to prevent this. 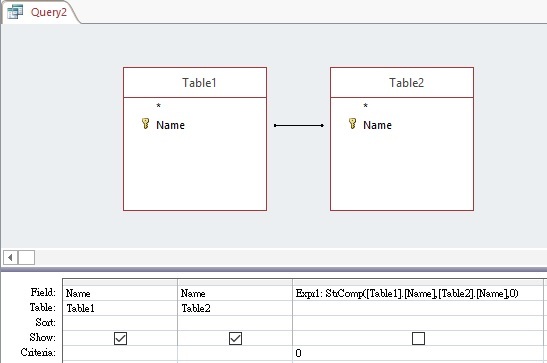 In an Inner Join, the two key fields have to be exactly the same in order to display the records. Let’s say we have two Tables, Table1 and Table 2. All the results will return because Access is case insensitive. To perform case sensitive Inner Join, make use of StrComp Function to perform a binary comparison (case sensitive comparison). The Expression returns 0 if two names are the same under binary comparison. Run the Query, only exact matches are returned. It is difficult to do a direct Left Join (perhaps there are ways but I just don’t know), instead we can make use of UNION to join two Queries. For UNION, we have to type the SQL directly in Query SQL View if we want to elegantly perform everything in a single Query instead of joining two subqueries. Now we got the result that has the same effect of Left Join Table.